An “unofficial visit” is the same college visit that your non-rowing peers take. 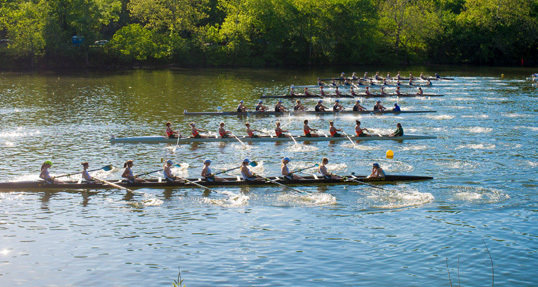 What sets it apart is your interest in college rowing, meeting the coaches, and seeing the rowing facilities. It’s called an “unofficial visit” because the college does not pay for any of your expenses like they can on an official visit, and because it can occur before your senior year. Visits are a two-way street: you get to learn about the rowing program and the coaches get to learn about you. It’s often best to wait until after your sophomore year before meeting coaches as a college prospect. To schedule an unofficial visit first consult the college’s admissions office website. Visit when classes are in session, if possible. Once you have some dates in mind email the coaches. Email is better than calling, and it should come from you, not your parents. Expect coaches to want to know about you before the visit. Supply your current unofficial academic transcript, any PSAT/SAT/ACT score reports, and the basics of your rowing background (school or club, height, weight, erg times, and significant race results). Send this ahead of time rather than just bringing it with you. Go online and submit the questionnaire even if you can’t complete every question. You can always update it later. Know exactly where you are meeting and arrive on time—not early or late. Err on the side of formality when you address the coaches. They will probably have a routine for how they conduct visits. Follow their lead. They may wish to sit down and chat with you, give you a tour of the boathouse, or have you ride along in the launch for practice. Pay attention, listen, and try to get a feel for the place. Always be asking yourself, “What makes this place different?” Show that you are genuinely interested in the rowing program and ask good, appropriate questions.